If you happen to own an iPhone 4 and consider yourself a power user, you're probably always finding time to charge your handset whenever it's not in use. 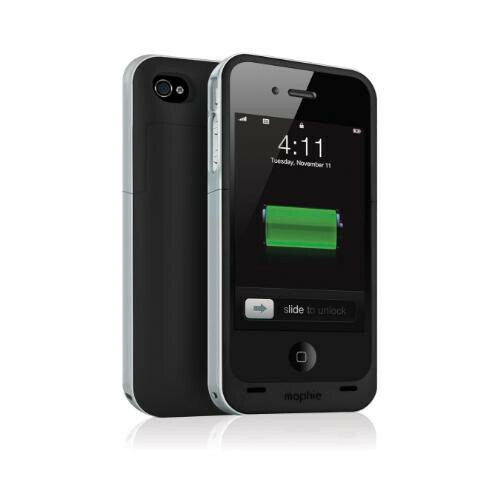 As we've reported last week, it looks as though Mophie made good on their promise of releasing their Juice Pack Air for the iPhone 4 which essentially doubles as a case and battery. Now this isn't just your ordinary battery case accessory because its 1,500 mAh lithium polymer battery employs some neat precautionary features such as overcharge, short circuit, and temperature protection. In addition, it has a four-light LED battery indicator and a pass-through USB port which will allow you to sync the phone with iTunes without the need to remove the case. Luckily, you can scope one right now if you really require it for a mere $80 since they're ready for shipment as promised. It looks thin enough though..